J-Novel Club Forums | Date A Live comes West... In a Video Game version! And it's Not a Mobile Game! Date A Live comes West... In a Video Game version! And it's Not a Mobile Game! 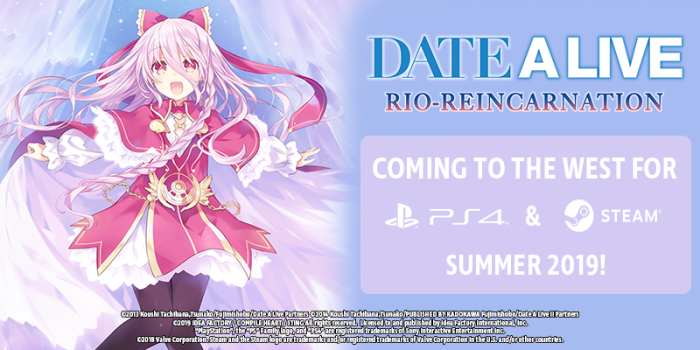 The visual novel, Rio Reincarnation for PS4 (2 cut CGs) and STEAM (unedited). Edit: Holy cow, this is 3 games in one? I actually cried when I saw it. I cried a lot. Alright, I'll stop being cruel. I honestly know nothing about Date A Live. Hopefully I can jump in with the game. I watched the anime a few years ago and there is another season coming next year as well. It's always been one of the series that I wanted to read the book of. In saying that, I'm so glad that the game is actually coming though! @terrence Going by what I've read about these games I wouldn't recommend it, I'm honestly not even sure I'd recommend the anime since it cuts out so much. edit I do think the light novels are worth reading though. Wow. It's 3 games in one? And it'll be available on STEAM?! Woooooow! The stories are linked btw so do play in order. Just a reminder to everyone not to buy this on PS4.